Discover The Absolutes Rose Geranium Eau de Toilette from Panier des Sens. 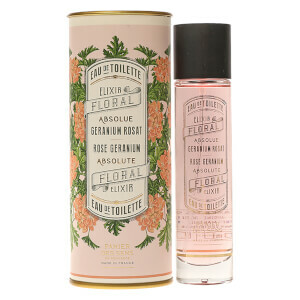 Opening with light and luminous notes of Mediterranean Flower Leaf, the floral elixir is enhanced by Geranium and delicate Rose and Peony accords, before settling on a base of White Musk. Housed in an elegant bottle and matching tube. Alcohol Denat.,Aqua (Water), Perfum(Fragrance),Pelargonium Graveolens Extract,Diethylamino Hydroxybenzoyl Hexyl Benzoate,Ethylhexyl Methoxyciannamate,Ci 19140(Yellow 5), Ci 17200 (Red 33), Bht, Alpha-Isomethyl Ionone, Benzyl Benzoate, Benzyl Salicylate, Citral, Citronellol, Geraniol, Isoeugenol, Limonene, Linalool.